As the population ages, migrates and otherwise changes, health status and healthcare needs change by location, type and in other ways. Data on health status, characteristics and trends continue to become more available, particularly at the county geographic level ... but these data are often difficult to locate, integrate and use in a combined manner. The following graphic illustrates how Veterans Administration hospitals and facilities (red markers) can be viewed in context of urban/rural patterns. 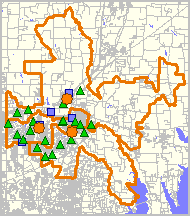 Urban areas are shown with orange fill pattern. 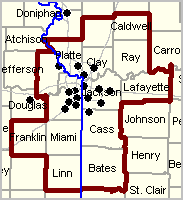 The Appalachia 405 county area is shown with black bold boundary. 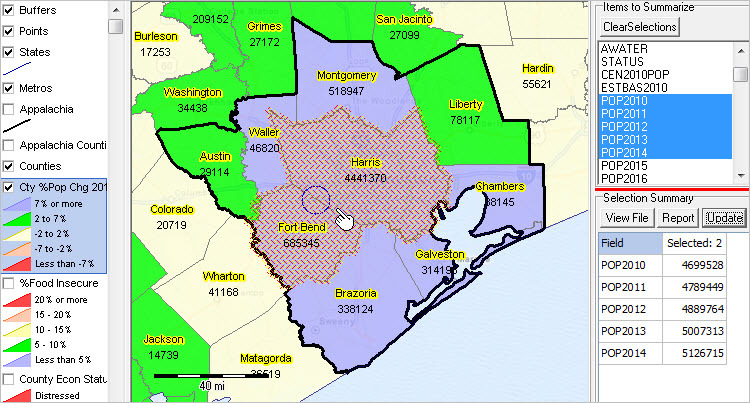 Use (GIS) resources to examine additional patterns such as the distribution of veterans by census tract based on the American Community Survey (ACS) data. -- click graphic for larger view showing details. Appalachia counties shown with bold black boundary. This section provides an overview of accessing, integrating and analyzing demographic, economic and health data with a focus on county and sub-county geography. 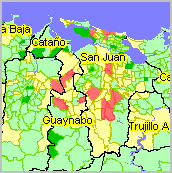 Geographic information system (GIS) tools are used to visually and geospatially analyze health-related patterns and characteristics. Applications reviewed here are developed using the CV XE GIS software and associated U.S. national scale health GIS Project. Additional ProximityOne ready-to-use shapefiles could be added containing all data from the American Community Survey demographic-economic profiles. The same scope of subject matter, annually updated, is available at the ZIP code, census tract, county and other geography. See related interactive tables (four related web sections) for subject matter details. 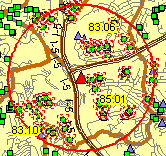 The CV XE GIS software is used with the County Health Patterns GIS project to develop views/applications shown below. These views/applications illustrate how the health analytics resources can be used. Select from wide ranging alternative measures. The following view shows patterns of %population change 2010-2014 using the CountyTrends layer/dataset. This view also illustrates use of the Site Analysis tool to aggregate and display population by year 2010 through 2014. 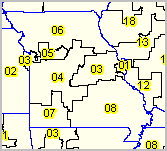 This view also illustrates use of the Metros layer to show outlines of Missouri metropolitan statistical areas (bold red/brown boundary). 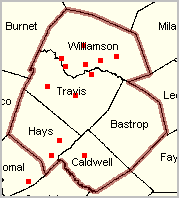 Counties are labeled with the 2014 population estimate. The following view shows patterns of percent smokers by county using the County Health Rankings RMD layer/dataset. The following view shows patterns of food insecurity by county using the County Health Rankings AMD layer/dataset. 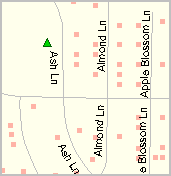 The following view shows a zoom-in of the above view. The following view shows patterns of economic distress based on an index developed by the Appalachian Regional Commission. ... this PCSA is located in Mingo County, WV and Pike County, KY.
... same view as above with census tract layer turned on. 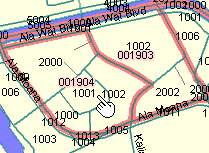 The following scroll sections provide field names and subject matter descriptions for each of the shapefiles/datasets used in the GIS project. The following table lists items available in the ProximityOne County Trends dataset. 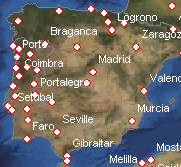 Create thematic pattern map views of any of these items alone or in combination with other items. 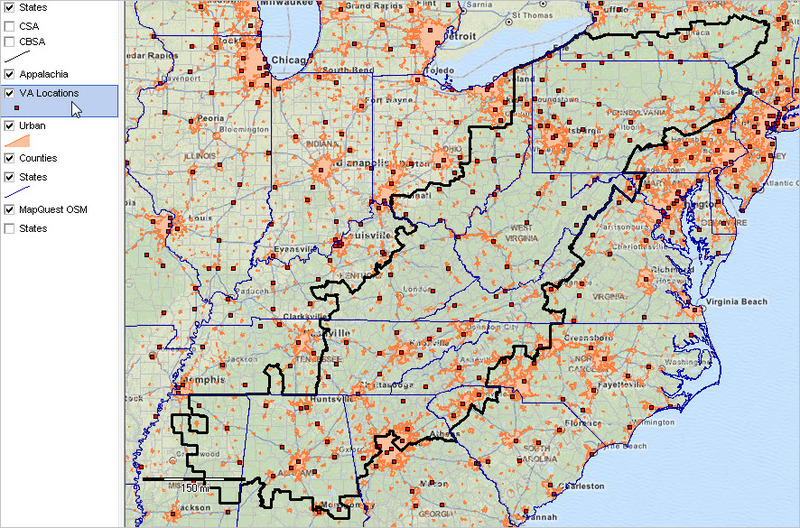 These fields are contained in project shapefile cb_2013_us_county_500k_countytrends.shp. Availability of 2015 estimates and projections to 2020 vary by version installed. The following table lists items available in the County Health Rankings RMD dataset. 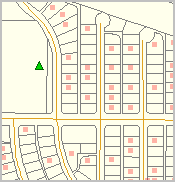 Create thematic pattern map views of any of these items alone or in combination with other items. 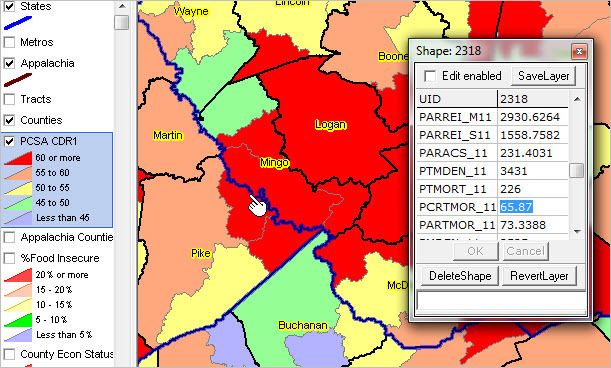 These fields are contained in project shapefile cb_2013_us_county_500k_ch_rmd.shp. List of items shown below is also summarized starting on page 1 of this document. The following table lists items available in the County Health Rankings AMD dataset. Create thematic pattern map views of any of these items alone or in combination with other items. 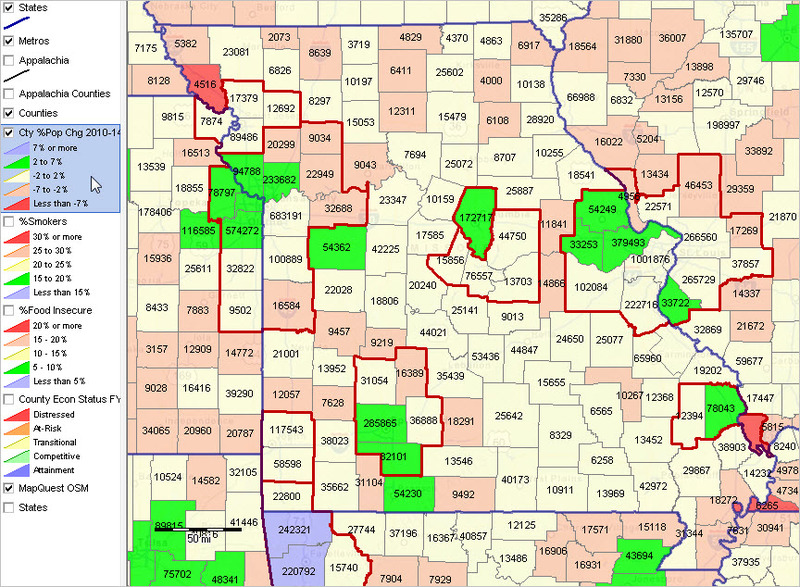 These fields are contained in project shapefile cb_2013_us_county_500k_ch_amd.shp. List of items shown below is also summarized starting on page 3 of this document. The following table lists items available in the "County Economic Status in Appalachia, Fiscal Year 2016" dataset. Create thematic pattern map views of any of these items alone or in combination with other items. 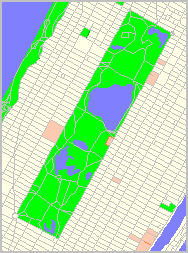 These fields are contained in project shapefile cb_2013_us_county_500k_arc.shp. 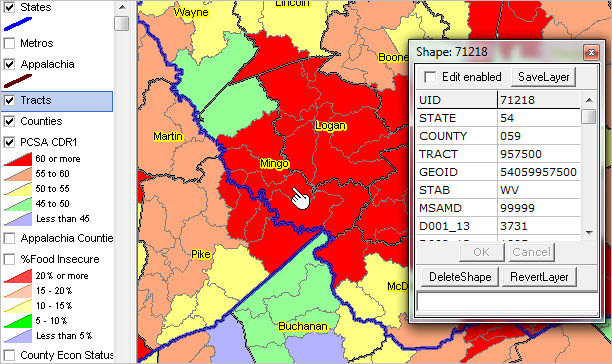 The shapefile includes all counties but only those counties that are classified as Appalachia are population with subject matter fields/items 6 and above listed below. List of items shown below is also available in the excel file referenced here. 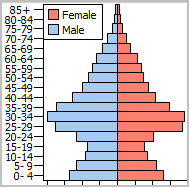 Learn more about demographic economic data and related analytical tools. Join us in a Data Analytics Web session. There is no fee for these Web sessions. Each informal session is focused on a specific topic. The open structure also provides for Q&A and discussion of application issues of interest to participants.